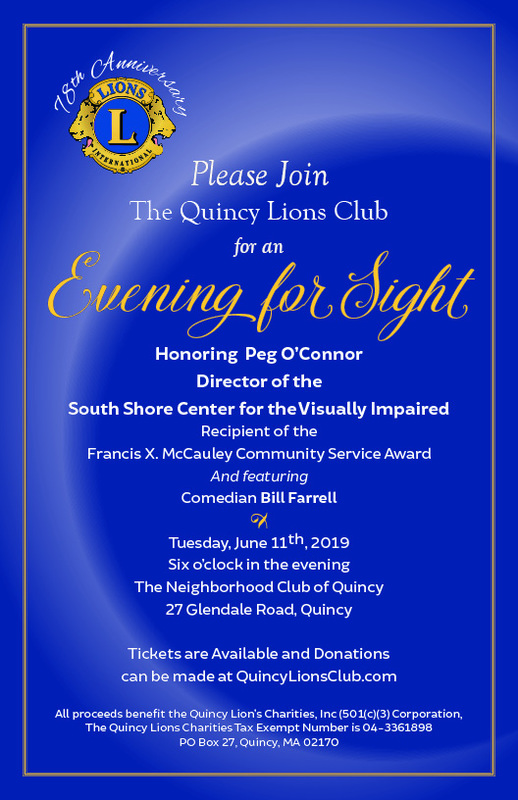 The Quincy Lions Club is celebrating its 78th anniversary serving the community of Quincy, and this year we will be honoring Peg O’Connor with The Francis X. McCauley Community Award at our Evening for Sight on June 12, 2018. The Quincy Lions Club gladly accepts eyeglass donations. Used eyeglasses will be refurbished and subsequently distrubuted to vision impaired indivduals accross the globe. Last year we were able to cooridnate the distribution of over 3000 pairs of eyeglasses, including nearly 800 pairs to the organization Light Up Lesvos, which helps support the needs of refugees in Greece.